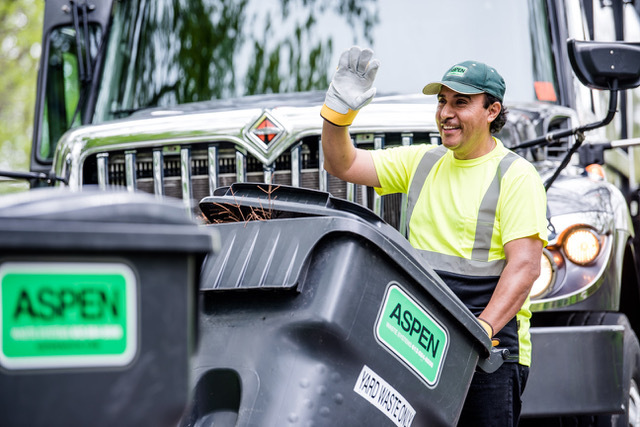 Aspen’s 2019 seasonal yard waste service begins Monday, April 1, 2019 for all service areas except St. Paul and Bloomington where service begins on Monday, April 15, 2019. Yard waste service continues through the week of Thanksgiving, weather permitting. You have two excellent options for clean, green yard waste service. Schedule your collection by phone or online at least one day prior to your service day. Place yard waste in bags made of paper or biodegradable, compostable plastic that meets ASTM D6400 specifications. A fee per bag will be added to your next invoice. Unlimited weekly pickup on your scheduled service day. Place yard waste in an Aspen cart, which you can rent for an additional fee, your own container, or in bags made of paper or biodegradable, compostable plastic that meets ASTM D6400 specifications. Enroll in seasonal service by phone or online. Seasonal service will be billed as a non-refundable annual fee. Sign up here. Call 612-884-8008 for current pricing.